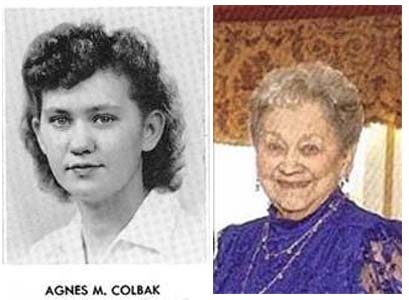 Agnes M. (Colback) Buffington 90, of Harrisburg, died Wednesday, January 21, 2015, at Lansdale Hospital, Lansdale. She was the widow of Robert J. Buffington. Prior to retiring, she was employed by the Pennsylvania Dept. of Transportation. Mrs. Buffington was born in Coaldale, daughter of the late Kastantas and Eva (Baljunas) Colback. She was a member of the Pa. Association of Retired State Workers and the Cross Point Church, where she participated in Bible Study and the Book Club. An avid Philadelphia Phillies fan, she was devoted to her grandchildren and her family. Surviving are a daughter, Valerie Holzhauer-Strangeway of Harleysville; a son, Robert Buffington of Harrisburg; four grandchildren; eight great-grandchildren; sisters, Dorothy Berk and Joyce McHugh, both of Coaldale. She was also predeceased by a brother, John J. Novitsky. Service: 1 p.m., Sunday at the Hoover Funeral Homes & Crematory, Inc., 6011 Linglestown Rd., Harrisburg, with the Rev. Jennifer Williams officiating. Interment, Blue Ridge Memorial Gardens. Call Sunday, noon to 1 p.m.
Memorial Contributions may be made to the Cross Point Church, 430 Colonial Rd., Harrisburg, PA 17109.